Advance care planning engages individuals in thinking about and planning for their goals in the context of a serious illness or life-limiting condition. It is a critical component of patient-centered care and helps by identifying and clarifying patient choices and, when the time comes, preferences regarding life-sustaining treatments. Medicare reimbursement for advance care planning conversations provides an impetus for providers to spend time exploring patient preferences and documenting goals of care. I’m Shirley Otis Green, and I’m delighted to be here. I’m from the Coalition of Compassionate Care California and we’re an advocacy organization for the seriously ill and I have a chance to talk to people here in regard to the Advance Care Planning Program that you have classes on, and that the concept is so incredibly important. We want palliative care providers, but all healthcare professionals to be able to provide person centered care. And that requires a conversation with a patient in regard to what they value most. What are the things that give meaning to their life? And being able to engage learners in better understanding in perfecting the skills to be able to have those kinds of meaningful conversations, that’s really important. A lot of us do assume that we know what we need to know, and we can do it just fine, thank you very much. But we know that from lots of evidence out there that patients tell us that those conversations are not always as in-depth and as useful as they would actually like them to be. And we know from the realities of care that’s delivered, there’s often a mismatch. So, our current way of doing this has been less than optimal. People too often get default care, which results in care that they don’t necessarily need or want, or benefit from. And it costs then our society a great deal of money. And it costs the patients potentially regret and time lost from the quality things that matter most to them. Family members then, are left with potentially, complicated bereavement. And a legacy of remembering their mother in an ICU bed, instead of being able to be at home looking out into the window of her backyard seeing the garden that she loved, and with her kitty curled up on her lap, and her granddaughter playing at her bedside. So, being able to create memories for the survivors, and being able to have the best and absolutely the most personalized and tailored care delivered to patients is, unfortunately, not being delivered consistently and reliably across settings. So, that leads us to believe that there is additional information that people would benefit from. The Advanced Care Planning curriculum at CSU is really wonderful. It gives people an opportunity to take the experience that they have, the good bedside skills that they already have, the clinical expertise that they have, but spend some time really thinking about, and explicitly exploring strategies for best practice related to end of life conversations. And hopefully, bringing those conversations earlier for people, so that all the patients that one sees can have the care that’s really tailored for them in the very best possible way. The Coalition for Compassionate Care of California in partnership with The California State University Institute for Palliative Care developed the Effective Advance Care Planning: Skills Building for the Entire Organization to expand the workforce of skilled professionals trained to promote and facilitate advance care planning in all care settings. These online courses detail critical components of advance care planning in the context of the new Medicare reimbursement. The Coalition for Compassionate Care of California has developed this course in partnership with The California State University Institute for Palliative Care. In this course, providers will learn the “soup-to-nuts” process for making advance care planning a routine part of any practice. 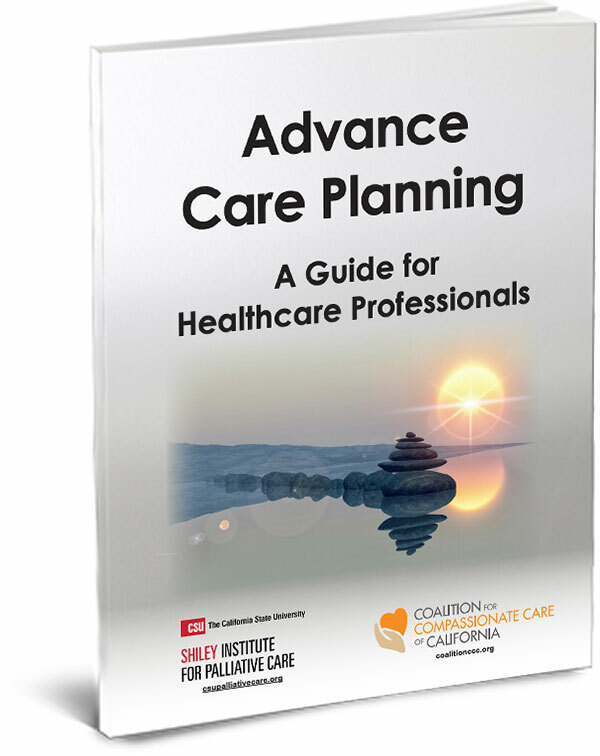 The engaging curriculum explains why advance care planning is so important, and discusses how to evaluate your current advance care planning efforts; how to educate your staff in advance care planning; and how to fully implement a new program and procedures. The first course, Effective Advance Care Planning Fundamentals, is designed for everyone who needs to understand and promote advance care planning. In this course you will learn the difference between the life-cycle approach and the values-based approach. You will gain an understanding of relevant legal terms and the differences between advance healthcare directives and POLST. You will learn to articulate the importance of advance care planning and describe trends in healthcare that make planning an urgent need in some settings. This course will benefit healthcare providers responsible for facilitating advance care planning conversations. Participants will learn to identify skills needed to engage in effective advance care planning conversations. You will become knowledgeable of how to initiate and facilitate a productive discussion on sensitive issues. Individuals and organizations will learn about the new codes and explore through case scenarios how to accurately bill Medicare for advance care planning discussions. Participants will be able to explain the circumstances under which Medicare will provide reimbursement for advance care planning. You will learn various ways to utilize and properly apply the new CPT codes.